Glenwood Art on Display in Montgomery | Glenwood, Inc.
On Thursday, May 24th, the Alabama Department of Mental Health (ADMH) hosted a reception for artists featured in their annual art exhibit. The month-long showcase featured artists that battle mental health issues who use art as a way to cope with their daily struggles. Three individuals served by Glenwood collaborated on an art piece titled “Capstone” that was featured at the event. Their art was created to celebrate The Hope Cottages that were built in partnership with Capstone Collegiate Communities and opened on Glenwood’s campus earlier this year. 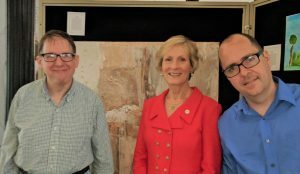 When ADMH Commissioner Lynn Beshear toured the homes and saw the art, she asked if it could be included in the May showcase. Art can provide freedom of expression and offers release for individuals with autism and other mental health challenges. The art that was created was truly inspiring. This entry was posted in Community, Glenwood in the News. Bookmark the permalink.